At last report, the lake level was up 2.5 feet since the big storm. Thanks to Peter Kilkus, the head man at Lake Berryessa News, for passing on this information. 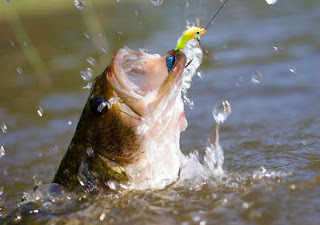 Expect this higher level to give bass a better place to spawn and hide. Get out your white tube baits, swim baits and curly-tailed jigs for the upcoming shallow water action. If you can get them in front of the bass’s nose, let it sit until you are sure the fish is ignoring it — then move it an inch or two. One pro had me finally — we actually hit the fish with the lure to get it mad. Since the big storm, this lake’s level has risen a foot. It’s an interesting contrast to the sharper and steeper rise at Berryessa — where the steeper banks and smaller surface area caused a bigger increase. A vertical foot signals a much larger horizontal coverage, putting miles of shoreline under water for the first time this year. See this for yourself — hold up a foot-long stick on a shallow bank to see how much more an extra foot of water will cover. We will all fish these carefully, using the same techniques described above for Berryessa. Fishing reports continue to show good Clear Lake catch rates with top weights at 5 to 6 pounds. Plastics and swim baits along with live minnows are still the baits of choice. I look for the live bait action to wind down in the next couple of weeks. High water pushed some river debris into the device the first day. But the continuing moderate flow of the past few days should let it operate efficiently. We will give you regular updates. After running slower and greener, Sulphur Creek, a tributary to the Napa River here in St. Helena, was pushed back out to its banks and running a gray/tan color on Sunday at noon. More water is coming to fill up the ground and reservoirs. Joel Sinkay at Leonard’s Bait and Tackle at Port Sonoma (260 Sears Point Rd., Petaluma) says the most consistent sturgeon action in the North Bay region is in the Napa River. It took Brad only a couple of hours to motor over from Port Sonoma, catch a 58-incher and motor home. I heard that it was still muddy but fishable and expected to improve. The good news is that the heavier fresh water inflows seem to have pushed sturgeon bait-stealing crabs away from the fishing hot spots. For more details and combo bait specials, call Joel at 762-7818. The well-regarded Leonard’s April fishing derby cranks up on April 1. That’s when you can call to find out the random derby target length for both bass and sturgeon. Fish for five top prizes in both categories right through to noon on April 29, when the winners will be crowned and the pig roast barbecue will commence. FYI — the first-place sturgeon winner will take home a Trevela rod rigged with an AVET sx5.3 gold reel. The bass master will win a Trevela rod sporting a silver Daiwa Saltist-lw 20 HA reel. National Guard FLW College Fishing is headed to the California Delta, March 31, for the third of four stops in the Western Conference. Forty college teams will be competing for a top award of $5,000 and a berth in the Western Regional Championship tournament. They will blast off from Russo’s Marina at 7 a.m. Saturday. Weigh-in at the same location begins at 1:30 p.m. Take your kids over to see this exciting program. Russo’s is at 39905 Willow Rd., Bethel Island, Ca. Our “home” teams are Thomas Kanemoto and Robert Matsuura, and Chase King and Travis Kuhn, representing two Sac State teams; fishing for the two Sonoma State entries are Drew White and Adrien Briens, plus Branden Fischer and Brendan Castro. The UC Davis entrants are Jason Moon and Christopher Beck, plus Philip Choy and Kousei Perales. Captain Barry Canevaro on the Fish ‘n’ Fool IV had a 100-inch sturgy caught and released Sunday. Barry is moving his boat to Isleton for the upcoming striper trolling action. Spring has always been one of the most interesting seasons on the Delta.